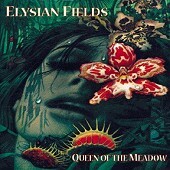 Like a Cat Power, but a bit poppier and with more seduction, Elysian Fields deliver the goods on Queen of the Meadow, a dark, eerie pop record that is slow, soft, and intimate at first glance. Upon further inspection, though, the album reveals a mix of grabbing lyrics, devilish charm, and plenty of sweet, seducing melodies to drown in. The album is soft, yet dark. It packs tremendous punch without even trying to disrupt, quietly taking over your mind while making your feet tap to the infectiously delightful beats that push their way to the front, above the submissive beats that you will also fall prey too. Rarely does an album make me think and tap my toes right from the get go. There was a handful this year, and Elysian Fields was one of them. The album instantly catches your attention with its layers of dreamy darkness, and at the same time makes you smile to the sweet pop that rears its face from time to time. I'll give this album an A.